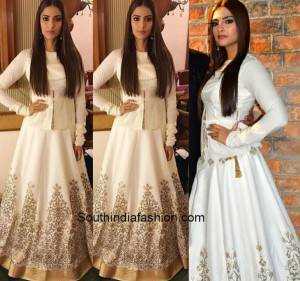 As Sonam Kapoor becomes the new face of the Rajshri productions with her latest “Prem Ratan Dhan Payo” her fans are all set to take some fashion notes from the diva. She is considered to be the fashion icon of Bollywood and she proves it right every single time. She’s playing the role of a princess in the movie and she looks stunning in her new avatar. 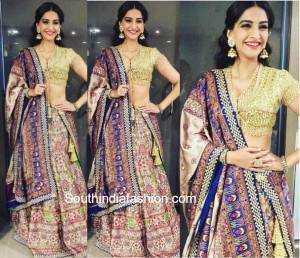 She’s been seen draped in beautiful sarees and elegant lehengas for the promotions of the movie. Even for the promotions, she carried her character quite well. 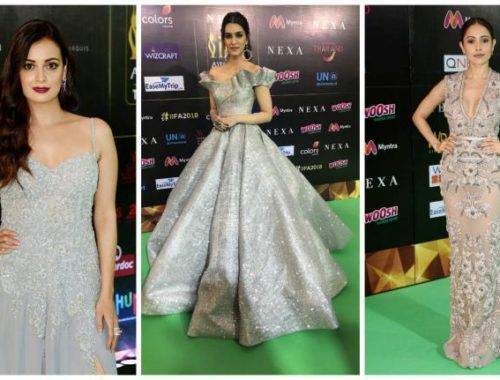 So we present to you some of the most exclusive looks of the Kapoor daughter for the promotions of her latest. Sonam was spotted in an Abu Jani and Sandeep Khosla lehenga in Ahmedabad promoting PRDP. She looked just astounding in the multi coloured lehenga and the golden jhumkis. And the diva decided to enter the BB9 house in this Anamika Khanna emerald green lehenga. The high collared, full sleeved blouse matched with the lehenga just perfectly. However, the traditional neck piece grabbed all the attention. 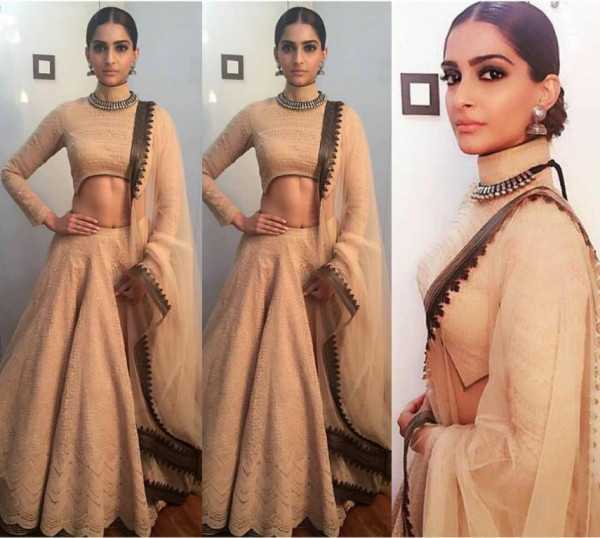 More than the Anju Modi pink lehenga, the way Sonam styled it galvanized us. 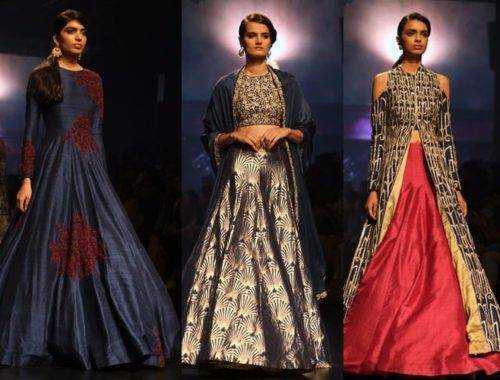 The ensemble is from the latest collection by Anju Modi. 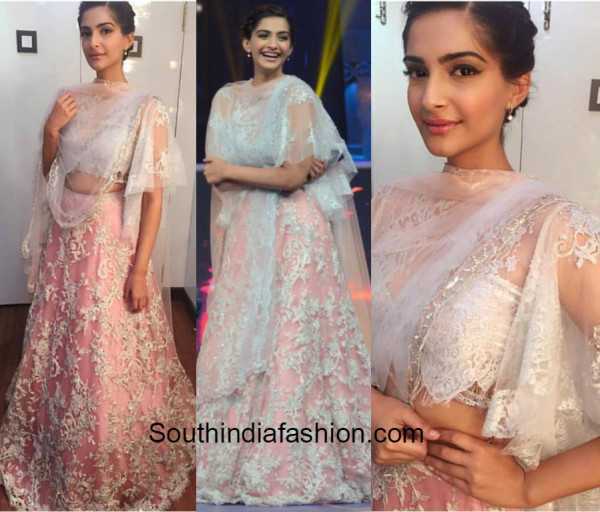 Sonam made an appearance in this couture on the television show Comedy Nights with Kapil. She was bejeweled with a maang tika and a pair of customary jhumkis by Anmol jewelers. The look was completed by the winged eye-liner and a neat bun. 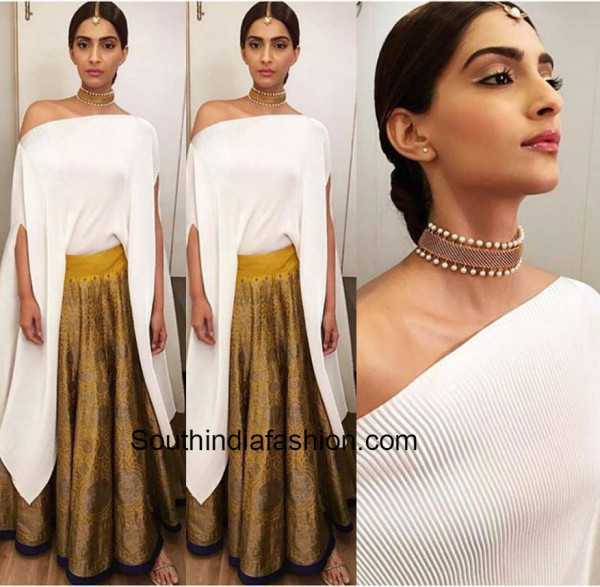 Sonam proceeded for a press conference in this Payal Khandwala outfit. She looked like an Egyptian goddess in the tucked white color cape top and the gold skirt. The choker was all she needed to make the attire look outstanding. The tiny maang tika by Suhani Pittie just proved the saying “good things come in small packaging” just right. In another promotional event Sonam styled a laced saree with a cape blouse by Rahul Mishra. She kept her accessories minimal to just pearl jhumkis which was a wise decision. 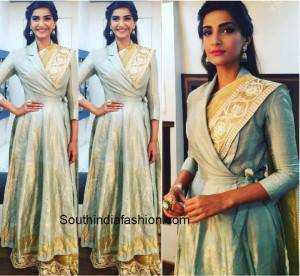 Sonam made yet another appearance on the television show Comedy Nights with Kapil in a saree and full length jacket by Rahul Mishra. The jhumkis and the cocktail ring were the most appropriate accessories for the look. Sonam carried her princess like look even for the promotions. She chose this beguiling gold and white lehenga by none other than Rohit Bal. She teamed it up with the full sleeved blouse with a slit in the front and it looked just exemplary. With her beautiful tresses down on her shoulders, the pearl danglers looked just right. She took our breadth away with her killer looks in this beige color lehenga by Shantanu and Nikhil. The way she embellished her look with the silver choker and jhumkis by Amrapali jewelers is worth all the applaud. The bun was the best hairdo with this couture. No one carries style like she does. Sonam appeared recently on a television show for the promotions in a net lehenga in pastel shade by Shehla Khan. The small pearl ear danglers let the lehenga steal all the attention. 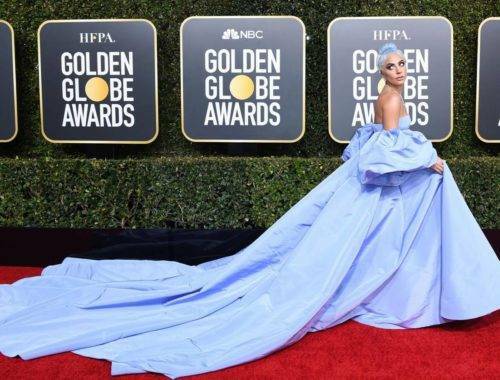 Yet again she proved that she is a fashionista. The Ashish and Soni long black color gown with golden print on it made her look bold and beautiful. The gold heels and the statement neck piece took the whole look of the get up to a different level altogether. She decided to go with this colorful Abu Jani and Sandeep Khosla salwar kameez for one of the promotional events. She looked just perfect with the diamond ear studs and the strapped heels. So, to sum it up all her looks for the promotional events were a treat for her fans. Also check out Iy’s dubsmash debut on PRDP! Too cute!